Lake Minnetonka faces serious threats and management challenges. The likely introduction of more harmful exotic plants, animals and viruses, pose serious, even deadly threats. More effective and comprehensive control of milfoil is possible and desirable. Attending to either, or both, of these is critical and will require significant financial underwriting. Lake Minnetonka Association members must provide financial support to protect Lake Minnetonka because no one else will. In my position, I often hear lakeshore owners frustrated, sometimes angry, with lack of government or agency initiative or investment. I also hear strong suggestions that boaters should pay for management and prevention efforts, because they are the ones bringing exotic species into the lake. The problem is this – neither government nor users can be looked upon for significant financial support to protect our lake. Governmental attention at the federal, state, and even local levels is focused elsewhere. At all levels, we have serious deficiencies in funding and policy support for failed and failing systems that include: energy, transportation infrastructure, public works infrastructure, health care, social security and Medicare, and education. This means that environmental programs come very low on the priority list. Even with these obvious critical priorities, there is gridlock. Bottom line – critical and essential support for protecting Lake Minnetonka will not likely to garner significant attention any time soon. In an almost perverse way, tax reduction initiatives are also a priority. This means that local governments – cities and counties – are being forced to confront reductions to non-essential services. Again, this leaves Lake Minnetonka on the back burner. What about user fees? While we have advocated for user fees as a fair and proportional way to help pay for management and protection actions, especially for those involving exotic species, the political hurdles are formidable. Is this fair? No. Is this realistic? Yes, I believe it is. A criticism often leveled at Lake Minnetonka protection initiatives is “Why should the state or local government or users pay to protect Lake Minnetonka when the residents are so wealthy?” Certainly, looking at the demographics and real estate around the lakeshore, there is obviously wealth here. But this misses the point. It is disingenuous when agencies and others point out the lake is really a public resource, then use arguments likes these to support inaction. In fact, we are lucky to have this wonderful lake. Lakeshore owners, businesses, and the greater community enjoy the great wealth Lake Minnetonka provides. Lakeshore owners and businesses should have the motivation to voluntarily support protection efforts as being in their best interest. Local communities, especially the cities, have given the clear message they cannot afford significant protection efforts. However, I think they should demand and expect vigilance and enforcement of laws and ordinances that are already in place – something that can occur with minimum financial outlays. So, Lake Minnetonka faces serious threats. Our governmental agencies and their elected leaders may not have the stomach to do what is really needed, and they clearly have other critical priorities that, as a practical matter, have precluded their support to protect Lake Minnetonka. And, while this may be wrong-minded, it is unfortunately where we are. We should continue to demand our lakes get the protection they deserve, but in the meantime Lake Minnetonka will not be protected unless we step up. Mostly get involved. This is civics-101. Contact your state and local representatives and tell them protecting Lake Minnetonka is a priority. Also tell your Lake Minnetonka Conservation District representative. State and local leaders can affect significant differences with little or not additional money by critically looking at policies and priorities – does the size of dock platforms matter if zebra mussel gets into the lake? Can we implement fees to offset the costs of a credible protection program? Effective programs for protection and control of exotic species require funding. 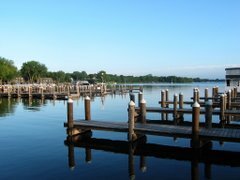 Lake Minnetonka lakeshore owners and businesses should voluntarily step up to fund the advocacy, protection and control efforts. Without this voluntary support – the value of Lake Minnetonka to our community is at risk. The Lake Minnetonka Association has a demonstrated track record of catalyzing positive action to protect Lake Minnetonka, but without additional funding, our efforts can go only so far. Lakeshore owners and businesses must step up and support the Lake Minnetonka Association so we can redouble our efforts to protect Lake Minnetonka. If you don’t – nobody else will!